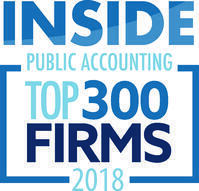 H&CO, LLP is proud to announce that it was ranked among the top 300 largest public accounting firms in the United States by the leading industry publication INSIDE Public Accounting (IPA). This is the second consecutive year that our firm is ranked in this prestigious list, moving up from #282 in 2017 to #266. The IPA ‘Top 300 Firms’ list, now in its 28th year, is ranked by U.S. net revenues and compiled by analyzing more than 550 responses. The rankings and the accompanying analysis create a comprehensive picture of the state of the accounting profession today. You can find the complete list of IPA Top firms here. H&CO is an accounting and advisory firm specialized in providing national and international corporate, tax, and advisory services to multinational firms and international investors. We are committed to providing superior personal attention and take pride in giving you the assurance that the personal assistance you receive comes from years of advanced training, technical expertise and financial acumen. By delivering high-quality professional services on a timely basis, we have built a solid reputation as a trusted advisor in the field of international taxation and corporate tax services for small and midsize companies.